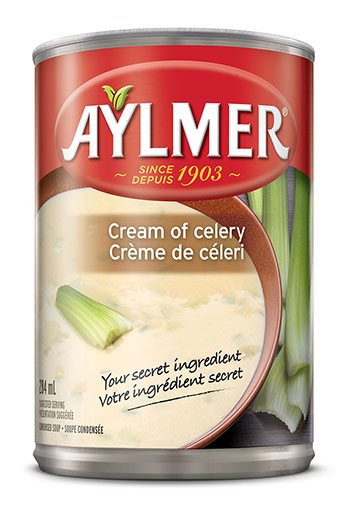 We are a small Canadian soup company who understands how the love of good food can bring people together, creating smiles, laughter and joyful conversation. Inspired to spread the joy far and wide, we have perfected our soups using traditional recipes and locally available produce, to create a range of flavourful soups that customers tell us taste truly ‘fresh and organic'. The difference between our soups and others is a difference you can actually taste. 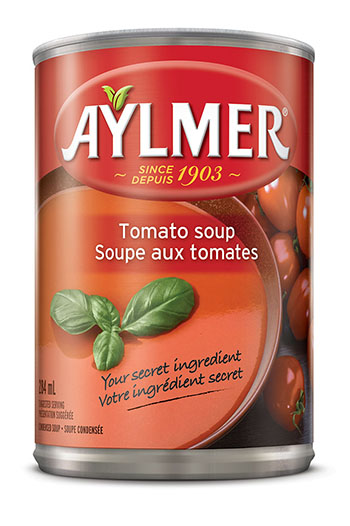 Smoother, lighter and more subtle in flavour, Aylmer soups deliver the natural sweetness and distinctive taste of each individual ingredient. The delicately balanced flavours and light seasonings also allow home chefs to complement a recipe rather than overpower it. As a result, our soups are the secret ingredient behind many great meals… because Mother Earth has contributed everything needed to make it so. 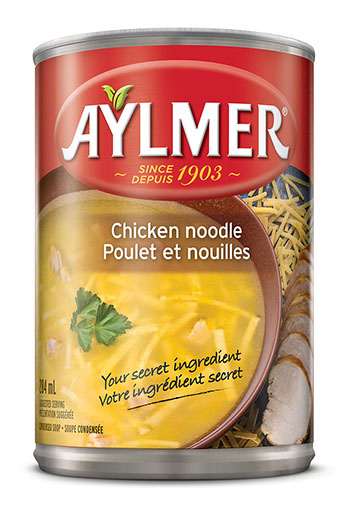 Today we invite you all to taste, be inspired and share your experiences with Aylmer soups. Enjoy! Our condensed soups provide a rich, reliable flavour base for any recipe from lasagna to meat loaf to scalloped potatoes. We provide the base. You provide the love. Simmered slowly in our kitchens, the hard work is done so that you can concentrate on your culinary creations. 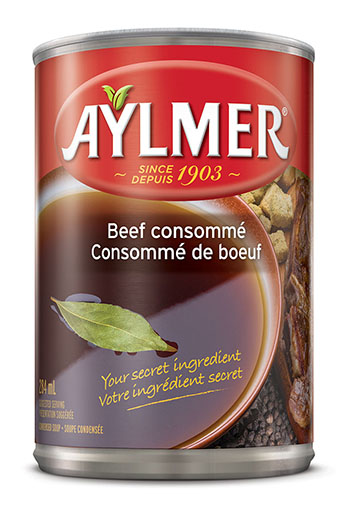 Serve as-is (consommé) or as a base for sauces and other soups. 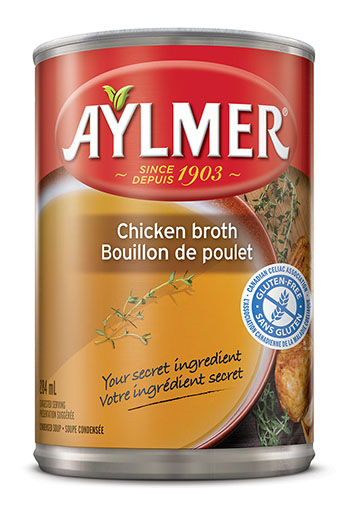 Aylmer broths can also be used as a braising liquid or to create delicious glazes. Gluten free and low sodium products are important for many of us. 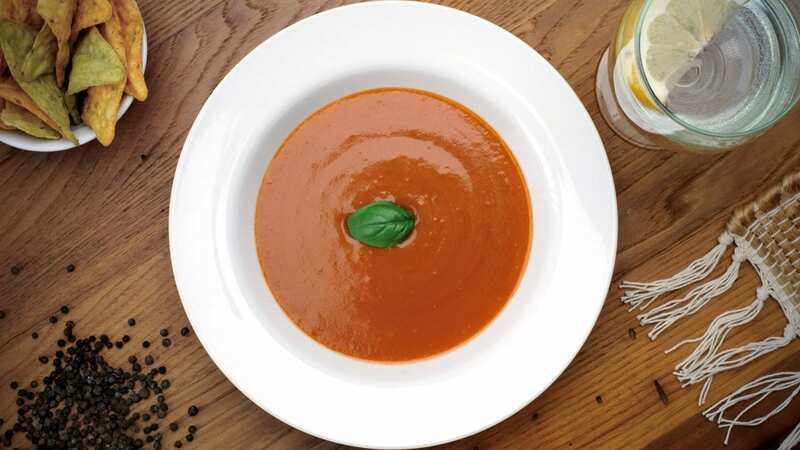 Our line of Gluten-free soups – Chicken Broth, Cream of Chicken and Cream of Mushroom – along with our Low Sodium Tomato Soup are the perfect recipe starters with all the flavour you want, plus the safeguards you need. 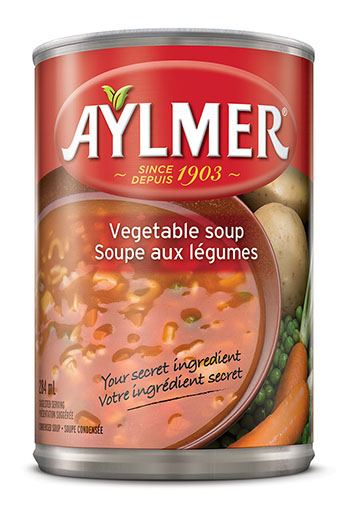 We make 100% of our soups in Saint Hyacinthe, Quebec. Following the seasons, we get the best produce for every batch we prepare, our chefs select ingredients with great care to achieve perfect simplicity in flavour. 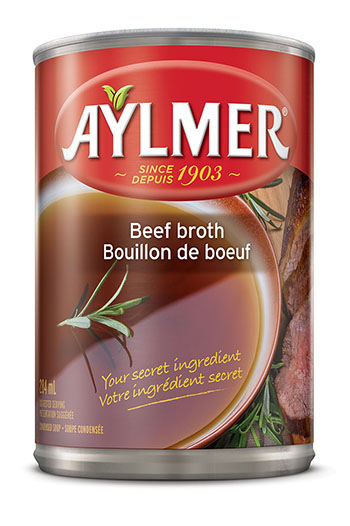 Aylmer soups mean consistent great taste and pure simplicity in the kitchen. We are proud to have earned the trust of many home chefs, who not only use our soups to heat and serve, but as a base ingredient for many of their recipes. 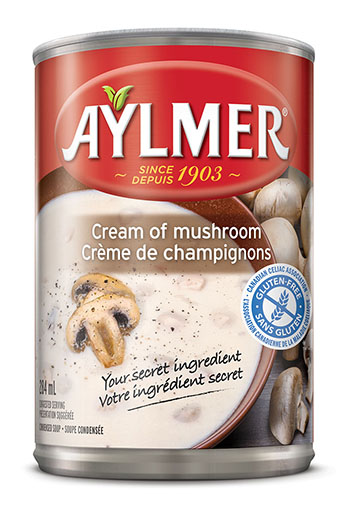 Whatever you have in your cupboard, cookbook, or family recipe collection, Aylmer helps you prepare it in your own unique way. The selection of our ingredients is critical to the taste of our food. One of the most important criteria is to buy vegetables that are at the right level of ripeness at the moment we are ready to start a new batch. In season, most of our vegetables are sourced from within a ten-hour radius of our kitchens. Out of season, we follow the sun to where vegetables are of the same high quality. Garden vegetables like carrots, corn and green peas are all sourced locally here in Canada. Vegetables are selected on the basis of their nutritional value, contributing to a healthy diet. Roma tomatoes are home grown in Ontario. Carefully nurtured and ripened for that juicy straight-from-the-garden taste. Starch comes from potatoes sourced by season in Canada and the U.S. so that our soups are made with the freshest, most flavourful produce available. 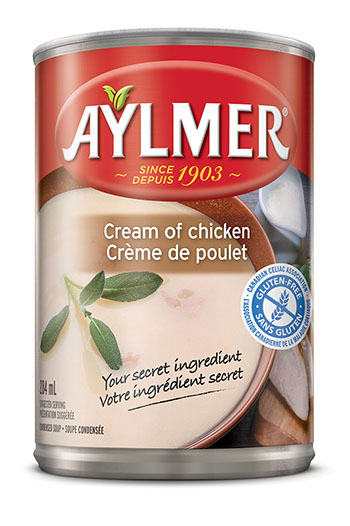 Protein Our Aylmer experts work full-time ensuring that our protein choices are of the highest quality and are sourced from only the best farms across the USA. 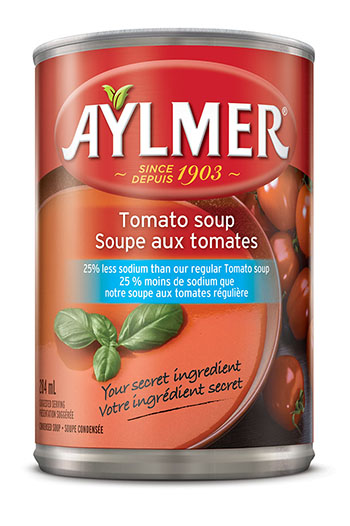 The result is a difference you can actually taste: the difference that makes Aylmer soups the closest thing to homemade that you'll find in the soup aisle.